Losing a tooth can leave an unsightly space or affect the enjoyment of your favourite foods. Dental implants are small attachments placed in the bone in place of a missing tooth. A replacement tooth can be secured to the implant. The new tooth will look and perform like a natural tooth .Dental implants can be used to replace or stabilize existing dentures so you will once again be able to enjoy your favourite foods and feel confidence in your appearance. Implants at this Practice are placed by John Moorhouse and Andrew Legg. Here we have used 2 implants with Locators to allow a complete lower denture to be secured so that it will not move at all during use. If you would like more information about dental implants please get in touch with us, or you can follow the link to the Association of Dental Implantology The slideshow below shows the placement of an implant with the addition of artificial bone. Just click on the picture to go to the next slide. 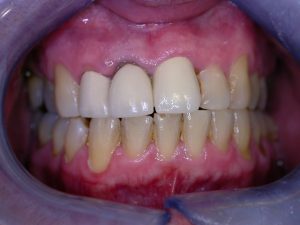 If teeth are very broken down we can restore their appearance and function with a crown. Normally takes about 30 minutes to prepare your tooth and take impressions. 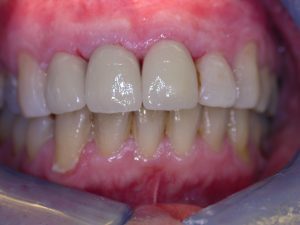 Often we will take a photograph so that the technician can copy any features of your natural teeth to make your new crown as natural as possible. The crown is a bespoke item made just for you and is usually ready for fitting in around a week. Existing crowns with ill fitting black edges can be replaced and no one will know the secret of your smile. At Morgan Dental we aim to provide high quality care for every patient, every time. To do this we want to hear from you when we do well and also when we don't meet your expectations. Compliments - all members of staff are very pleased to hear if their care and support has been appreciated. You can pass on your compliments by email or in writing. Complaints - despite our efforts, there are occasions when you might wish to complain. Please click here for our complaints procedure.